What is the Witness King Tides Project? Witness King Tides is a fun community photography project that helps us visualise the potential future impacts of sea level rise. When king tides hit, we ask coastal communities around Australia to head out and snap pics of local landmarks during the very high tide. These photos capture what our coastal communities may look like in the future, as global sea levels rise. Together, these images build a picture of the threat posed by sea level rise across Australia and help track the future impact of climate change. Dates and times vary across South Australian, West Australian and Northern Territory coasts, so check out the map below. After you snap photos of this summer's king tides, upload your images! 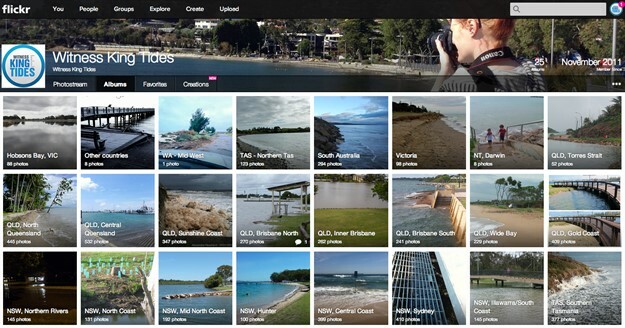 Your photographs will help us visualise what our coastal communities may look like in the future, as sea levels rise. More than 5.300 images can be viewed on the project flickr stream. 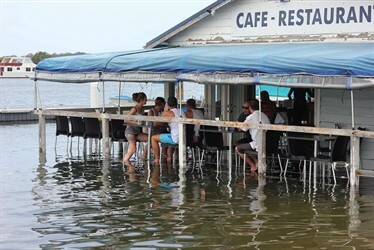 King tides happen at different times right around the Australian coast and sometimes occur during the night. Check the map above to see when the 2014/15 summer tide will peak near you. If the date for your location has already passed, check back soon as we are updating the map with the new king tide times! Remember, you can also witness the effect of the king tide at high tide on the day before and after the peak of the King Tide. Be sure to stay in touch by registering to participate. We'll send you a reminder email before king tides and keep you up to date with all the latest Tide Tracker news! Since 2012, over 5,300 photos have been uploaded through this initiative from the Torres Strait all the way down to Hobart, then across South Australia and back to Perth and Darwin! The IPCC's recent report concludes that earth's atmosphere and ocean have warmed, the amounts of snow and ice have diminished, sea level has risen, and the concentrations of greenhouse gases have increased. Global mean sea level will continue to rise during the 21st century. The Witness King Tides project is raising awareness about what that means at a very local level around Australia, so that coastal communities can become engaged with and participate in how we respond. I urge people of all ages to contribute to the Witness King Project and repeat the process next year. Every picture tells a story and will surely kick-start local action on climate change. We have 7 kilometres of rugged cliffs and beaches in the City of Marion, and I always encourage our community to get out there and enjoy their beautiful coastline. As a council, we are committed to the future of our coasts and I’m excited to be part of the Witness King Tides project. I can’t wait to see what photos the Marion community and visitors share with us. I have been shocked at the rapid loss of sand dunes on Adelaide’s northern beaches over the past few years so jumped at the chance to help raise awareness of sea level rise. I am pleased to be involved with the Witness King Tides project as I have grown up on the Sunshine Coast and have seen first hand the rising sea levels. I hope this project can help monitor our beautiful coastline so that future generations can enjoy. Sea levels are rising but compared to our short time here on Earth, it’s happening slowly so documenting the king tides on your slice of coast will be an invaluable contribution to future scientists. Surfers have more to lose than most from rising sea levels. The joy of surfing comes with a responsibility to monitor and care for our coastal environment. Grab your camera and check out the tide this summer. Each year around January the time of the Witness King Tides project Far North Queensland faces the threat of cyclones, each year I observe more beach erosion. This year I look forward to getting together with a crew of photographers and like minded people to capture the king tide on 22 January 2012, JOIN US as we capture and create a photographic database of our Queensland coast. Australia is really just one BIG beach. WKT is truly an exciting opportunity and for you, the family and friends to get out there and be part of the solution and the science. It’s fun and educational, and a chance to witness and record this natural phenomena on the most remarkable coastline in the world. Sea level rise is a major threat to coastal ecosystems and Tasmania's coasts are some of the most vulnerable. As sea levels continue to rise, species that depend on low-lying coastal habitats are particularly at risk. Witness King Tides is a great way for us to track potential impacts on coastal flora, shorebirds and native vegetation from projected sea level rise. Our coasts, our future. Understanding what sea level rise may mean for coastal communities is everyone's business. If you want to take control of your destiny - have a look at the tide this year. Townsville is a great place to live, especially because of our beautiful coasts. Our coasts will change in the future and Witness King Tides offers us an opportunity to visualise what those changes will look like. Grab your camera and get snapping! Witness King Tide will help raise everyone's awareness of just how mobile sea level is on a daily basis, and what the future will look like as sea level keeps rising. The more people are aware the more something might be done about climate change at all levels of society. An estimated four out of five Australians live within 50km of the coast, making it one of the most important areas for the population. Tides and water levels are a very big issue, particularly when superimposed in any storms that may be battering the coast at the time. 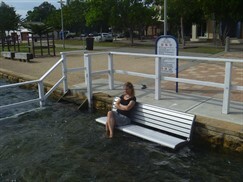 Get out during the king tide and visualise what our coasts might look like in the future.